As Pakistan PM held talks with opposition and Army, its citizens rallied on social media asking their govt to safely release the IAF pilot. Pakistan Prime Minister Imran Khan’s ‘goodwill gesture of peace’ Thursday to announce the release of Indian Air Force pilot, Wing Commander Abhinandan Varthaman, was a difficult political decision. But Imran Khan undertook some quiet and sensitive consultations with opposition parties and made the announcement in the joint session of Parliament. Qureshi also told me that the Indian government Wednesday sent a dossier on Jaish-e-Mohammed and that Pakistan is ready to talk about it. Both Imran Khan and Shah Mahmood Qureshi made these peace gestures to India, just a day after shooting down an Indian fighter jet. Since Khan’s announcement, many people in Pakistan have asked why PM Imran Khan was releasing Wing Commander Abhinandan Varthaman without any conditions or concessions. Some demanded that Pakistan swap the Indian pilot with the remains of Maqbool Bhat and Afzal Guru, who were hanged in Delhi’s Tihar Jail. An yet, a large majority of Pakistanis not only first rallied for the Indian pilot’s release but are also now supporting the announcement made by Imran Khan — an announcement he made not from a position of weakness but from a position of strength. “Bahadur Shah Zafar is not our model. The hero of this country is Tipu Sultan,” Imran Khan slipped this one, too, in what was a clear message to India: Don’t confuse our peace gesture with weakness because in the case of a war, we will not surrender but fight like Tipu Sultan until the last drop of blood has been spilt. We also learnt that the United States, Chinese and Saudi officials also advised PM Imran Khan to take some positive action to defuse the tensions with India. The release of the Indian pilot Abhinandan Varthaman was the most suitable option for Pakistan. Imran Khan also spoke to the leadership on that issue, and not just the political parties. It is important to note that Wing Commander Abhinandan Varthaman was not captured by the Pakistan Army. He was spotted and surrounded by some Pakistani youth of Horran village located seven kilometres from the Line of Control in Bhimber district of Pakistani Kashmir. The pilot emerged from his parachute safe and sound. He asked the locals whether he was in India or Pakistan. One young man tried to misguide him and said it was India. Abhinandan Varthaman then raised the slogan of “Jai Hind”. The youth got angry and shouted “Pakistan Zindabad”. The pilot realised he was in Pakistan and he took out his pistol. The youth pelted him with stones. Abhinandan Varthaman fired some shots in the air and tried to run away but was surrounded by a bigger mob. They roughed him up but the Pakistan Army personnel arrived in time and took him in custody. Now Pakistan is releasing him in the hope for peace. Will Narendra Modi respond positively? Many people close to Imran Khan told me that a telephonic contact will soon be established between the two heads of nuclear powers in South Asia and everything will be all right. Personally, Imran Khan is not very optimistic about Modi. He thinks Modi is in an election mode and peace does not suit him at the moment. Modi may ask for something more. 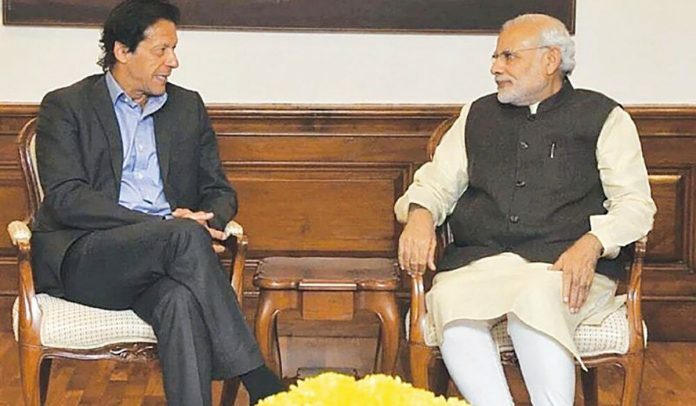 But the thing is, if Modi doesn’t respond positively to Imran Khan’s gesture of peace, then the international powers may get a window of opportunity to interfere in South Asia. And so, it’s time for India and Pakistan to move forward. War is not an option. They must start holding talks on terrorism and other issues that concern them. Imran Khan must invite the international media, including from India, to visit Pakistan. They should be allowed to visit Jabba near Balakot where India made air strikes on February 26. They should be welcomed to carry out investigations and play an objective role. In return, the Indian government can also allow Pakistani media to visit its country. It will help not only the governments of India and Pakistan, but also help their common citizens get rid of some deep misunderstandings. The release of Wing Commander Abhinandan Varthaman by Pakistan can be a game changer. Let’s change the game. You know what will change the game, Hamid? Hand over the buggers Azhar Masood and Hafeez Saeed, who are giving your country a bad name globally, to either India or to an international body. That is what will change the game, nothing else. Not handing over Abhinandan was never an option. I used to have respect for Hamid Mir, when he was against ISI for using terrorism as a policy few years ago. But things have changed. I have watched his show on Geo TV and I can certainly say that he is on the payroll of ISI. He was showing on TV that Indian air strikes killed only a crow. Suggestions to you Hamid Mir, why didn’t you let the International Media visit the site of bombings in Balakot?? Releasing IAF pilot isn’t a game changer, Pakistan is obliged both under a bilateral agreement with India and according to Geneva convention. So please come out of your imaginary world. There will no change of game until unless ISI and Pakistan army stops the terrorism against India. Otherwise you should that Modi isn’t going to let Pakistan go without paying a prize overtime Pakistan-sponsored terrorism hit India. Rueters, AFP, Aljazeera, etc have all been to the site. They all reported the same thing. 4 craters showing where all four bombs were dropped, and zero casualties. And old man who lived there was the only one hurt, who got discharged after getting first aid. Aljazeera has pictures from the site as well as satellite images corroborating this. The said madrassa which may have been the target was at least 500 meters away. Hamid Mir was right. The only casualty was a dead crow. It is also worth noting that the AOC who was commanding the mission for the IAF has been removed and chamged. Without any official reasoning. But i suspect its because not only the incursion in Pakistan failed to inflict any damage but also because he lost two aircrafts, including multiple casualties and a pilot captured the very next day. It’s been a bad week for the IAF. For once Pakistan has shown a Goodwill gesture , whether out of compulsion or genuine concern about escalating tension, a welcome one. Will Modi overcome his electoral compulsions and deescalate? A million dollar question.